Welcome to our wool tuft extravaganza! This article was first published in July 2001. As a car move forward, air passes over its body. 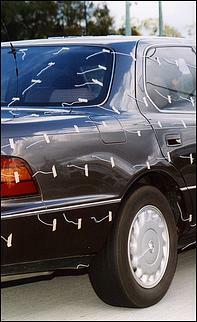 But, unlike a boat that pushes water aside, in the case of cars, the fluid (air) is invisible. So, while an implication of the air movement can be gained by looking at the patterns of water droplets and the deposition of dust, in most cases people don't really have any idea of the paths that the air takes over, under and around their car. 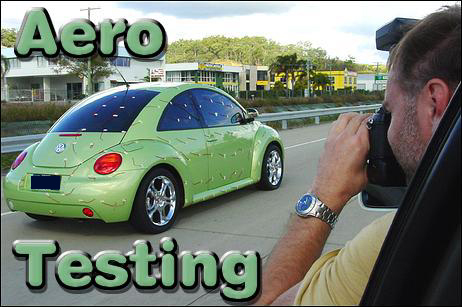 But help is at hand: it is a near zero cost process to wool-tuft a car and then drive it down the road, inspecting the pattern of airflow from another moving car! And why would you want to do that? Well, two main reasons, really. The idea is deceptively simple: cut up lots of short lengths of wool, selecting a colour that contrasts well with the car's paint colour. 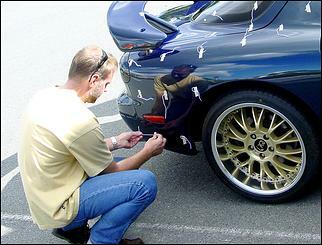 Using good quality masking tape (good quality so that it won't lift the paint when you take it off! 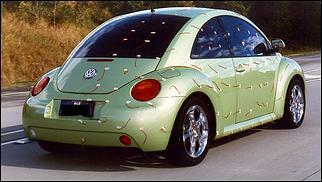 ), stick the tufts all over the car, keeping them far enough apart that they can't touch together. (If they're too close, they tend to adhere to one another.) If you want to be neat, stick the tufts in lines. Once you've done that, drive the car (or have someone else drive the car) down an empty, multi-lane road at about 70-80 km/h. From another car, shoot video or still pics of the tufts, including close-up details as well as overall shots. If you are concerned that the buffeting of the chase car will upset the target's aerodynamics, get further away and use a telephoto lens. 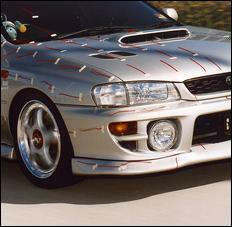 Airflow over cars can be basically split into two types: attached and non-attached. The slightly less precise alternative terms are also more descriptive: laminar and turbulent. At the front of a modern car, the flow across the surface of the bonnet will be almost always be characterised by laminar flow: the tufts will be lined up beautifully. The transition up the windscreen will also be laminar (ok, ok, "attached", then), but the transition from the windscreen to the roof may not be so good. If the flow detaches itself at this transitional change of angle, there will be turbulence across the leading edge of the roof. The tufts here will be whirling around, not lying flat and nearly still. On a sedan, the airflow will generally be attached at the trailing edge of the roof - but then it has to make the transition onto the rear glass. It's the back of the car which is most important in determining overall lift and drag, so it's really important what happens here. If the flow remains attached and laminar right down the back window and onto the boot, the car's doing bloody well. Why? Because when the air finally leaves the trailing edge of the boot, the cross-sectional area of disturbed air being pulled along behind (called the "wake") will be small. And a small wake equals lower drag. But if the air becomes detached, say, halfway down the rear window, then the wake is made much larger. If the flow leaves the car at the top of the rear window (eg all hatchbacks and the vast majority of old-shape sedans) you can see that the drag will be even larger again. So you see those bits of wool are actually an enormously powerful tool! So how good is on-road testing of the type described? Firstly, the point should be made that, not too many years ago, even performance manufacturers like Lamborghini used on-road wool tuft testing as a major part of their development process. 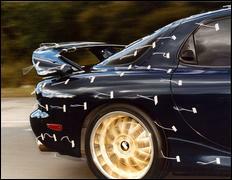 Secondly, while yaw angle airflow (ie a cross-wind component) cannot be accurately and consistently simulated on the road, in most other areas, the airflow over a car being tested on the road is very accurate - cos after all, cars do drive on roads, not in wind tunnels! The proof of the pudding, though, is when you compare wind tunnel woof tuft testing with the results of the same cars tested on the road. In general, the road testing is very, very close to the wind tunnel pics. Over the next issues we'll show you the results gained in wool tuft testing a variety of cars, and do some interpretation of those fluffy patterns. But if you want to get out there and do it, don't wait for us! It really is one of the most interesting tests you can make of your car - and since it costs near nix, what's stopping you?